In this post we’re going to take a closer look at the internals of the Questionnaire. The Questionnaire has a dual personality. If it only has questions then it is a template (and the status has options of draft, published and retired). If it has answers, then it is a form instance (and the status has options of in progress, completed and amended). It could be argued that this difference should be made explicit with a specific property – for the mean time we’ll refer to these personalities as a template or an instance/form. Authored. This is the date that the Questionnaire was authored – specifically the actual version of this resource – ie the date is updated whenever a new version is created. Subject. Who the instance refers to. Author. The person who recorded the information in the instance. When the instance has been completed by different people (eg the nurse fills in the start of an assessment form and the doctor completes the rest), then different versions of the instance will have different authors, and the version history will tell who entered what into the instance. Source. The person who actually supplied the information (who may not be the same as the subject). For example, a mother may be supplying information about her child. If the subject is supplying the information then this property is not needed. Similarly to the author, this could conceivably be different across versions. Just update the template (new FHIR version). You do need to be careful about backwards compatibility if form instances refer to external entities for rendering. Change the status of the original to ‘retired’, and create a new one with the same name (and identifier). It may make sense to have an extension to explicitly state the template version. Identifier. 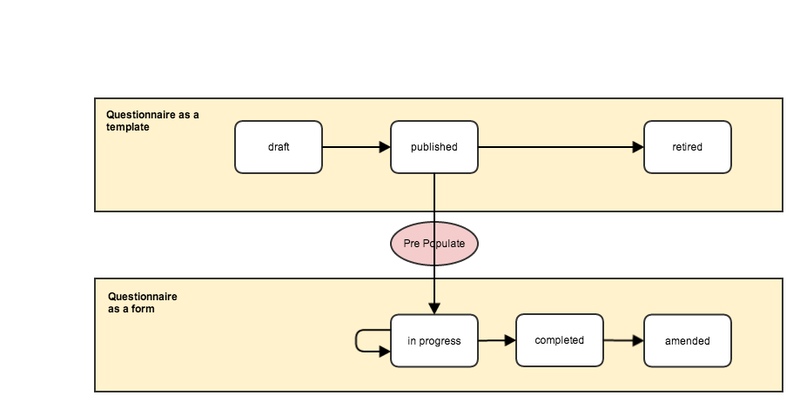 Also used for templates, this allows a template to be part of a business workflow – e.g. the template has the identifier of “POA-2013/15 revA” – or some such. Potentially you could the identifier.period to specify the date range over which the template was valid – so when you create or retire the template, you set the identifier.period.start and identifier.period.end properties appropriately. Encounter. This is an optional reference to the encounter where the form was completed. The actual content of the Questionnaire is contained in an element named ‘group’. There can only be one top level group in a Questionnaire and it is optional (A Questionnaire with no questions would seem to be a particularly useless beast, but you might want to create the template, and then later add the questions I guess). As an aside – I suspect that a better name for ‘group’ here might have been ‘content’ – and for clarity that is how we’re going to refer to it here. Lets start from the bottom by thinking about the Questions. Each Question has the following properties. Answer[x]. The answer to the question – if there is a single answer that is not drawn from a value set (we’ll discuss this in a moment). There is a fixed set of datatypes you can use here, and it isn’t possible in the Questionnaire to dictate what datatype to use – however you could create a profile for this purpose if you needed to. (A possible enhancement to Questionnaire would be to allow this in the Questionnaire as well). The permissible datatypes are: String, Decimal, Integer, Date, dateTime and instant. Obviously, the answer element will only be present in a completed form, not in a template. Options. This allows a question to specify a set of possible answers – as you would use in a ‘picklist’ or ‘autocomplete’ control on a form. The options element refers to a ValueSet resource – which is a very sophisticated resource with many different ways to define the set of answers (I should do a post on this resource some time). Choice. This is the selection that the user made from the defined options. It’s possible to make more than one choice from the list of options. Data[x]. This allows you to refer to a specific resource, or include an answer that is of a datatype not included in the the Answer[x] element. If you are including an answer of a specific datatype – maybe a CodeableConcept – then the element name will include the datatype – in this case dataCodeableConcept. Remarks. Comments that the author of the form wishes to include about the answer – perhaps they feel the answer is incomplete or inaccurate. It should not be used for the answer itself. Group. Allow you to have ‘questions within questions’. For example, the main question could be ‘Are you a smoker’, and the ‘sub-questions’ are only relevant (and possibly only shown) when the answer is ‘yes’. If you haven’t seen the format ‘ Answer[x]’ or ‘Data[x]’ before (i.e. the [x] bit), then what that means is that the element name includes the datatype. For example, if you used a string as the answer, then the element name is answerString; an instant would be answerInstant, and so on. Data[x] – when there is a different datatype or a FHIR resource that is the answer. (And this could be constructed from other data entered in the form, or a selected from an existing resource). A question arises: If you construct a resource based on data entered through a Questionnaire, how can you record both the original data and the resource in the Questionnaire? As of now, I’m not sure what the answer is – presumably you could create a Provenance resource that links the two, though that seems overly complex. Another possibility would be to use the remarks property. Or perhaps an extension on the answer that references the resource is the way to go. I need to think a bit more about the use cases where this would apply. Here’s an example of a simple form. It’s a pregnancy assessment with 2 questions; one will be a simple text answer and the other is a selection from a pre-defined list. To specify the list, we’ve included a ValueSet as a contained resource and expanded the options to include the name of each option so that they can easily be displayed to the user. (go check out the ValueSet in the spec if these terms are unfamiliar). If this particular set of options was used by multiple Questionnaires then it might make sense to save it as a separate ValueSet resource and reference it from the question rather than containing it. Should there be an indicator – or a list – when a single form has had multiple authors or sources. Should there be some explicit way of marking a Questionnaire if it is a template, or is inferring this from the status still be best way to go. This nicely leads me back to the connectathon. One of the key purposes of the FHIR connectathon – and the reason for choosing a theme – is to support implementers as they actually use these resources, and to feed back issues that arise during this into the resource design process. I think that the Questionnaire is going to be one of the more commonly used resources, so it’s a good time to look at it in detail. You really should be there! We aren’t quite done with Questionnaire yet – next time we’ll take a closer look at the grouping structure, and the standard extensions.